Solar domestic hot water High thermal mass, poured in place, concrete house with insulation on the outside, Hardie board siding,50 ft solarium with indoor planter bed, natural ventilation (no AC), polished concrete floors, universal access, metal roof, sun tunnels (solatubes), vegetable, fruit and herb gardens. 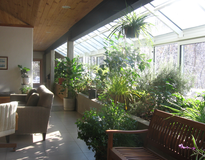 This "greenhouse" has not only many environmentally friendly, energy saving features but the solarium provides passive solar heat, 150 square feet of indoor garden and a view of the pond and outdoor gardens. High thermal mass features include stucco interior concrete walls, granite wall behind the wood stove, planter bed and porcelain floor tile. The open floor plan allows for air circulation and easy access. 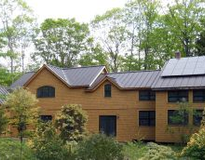 The house was designed to be zero maintenance, very low fossil fuel use, and very easy to move around in and clean with central vacuum. 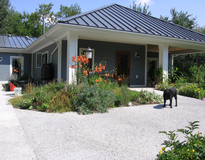 Yard is also designed for aging residents with a small "road" for an electric vehicle, raised vegetable beds, dwarf fruit trees, berries, native plants and no lawn. 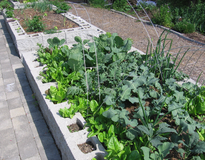 Other gardens include culinary and medicinal herbs. 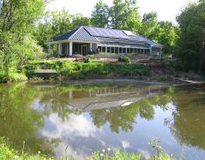 The house was designed not only as our home, but also as a teaching center for gardening and alternative healing methods. 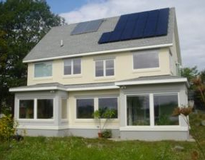 It has a lending library, plants to share and open to anyone planning on building or remodeling to include more energy efficient and water saving ideas. The house and its systems are four years old and there has been no need for maintenance of any kind. #1 to minimize our footprint environmentally #2 to provide a place where many technologies would be available for others to view #3 to encourage and inspire others to protect and improve the environment. Do not be afraid to jump in. Those in the clean energy field are very helpful. Wonderful experience with both companies. They listened well and also had abundant information. They were patient with questions. The house is on a tiny island in a federal wetlands. Concern for the environment, preserving the balance of wildlife and vegetation has paid great dividends. The biggest surprise was the lack of mosquitos with frogs, snakes, turtles and bats all doing what they do. Exit 9W from Northway (I87) onto route 146 (west). Garnsey Road is 6 miles on the right. 21 is on the right, just pass the pond. or Garnsey Road is two blocks east of the intersection of route 146 and Blue Barn Road.